In Portugal, Shag occurs exclusively along the mainland rocky coast, from Carvoeiro Cape towards south. Its breeding population was estimated in 2002 at about 100 to 150 nesting pairs. Most of the national population is concentrated in Berlengas archipelago, particularly on the Berlenga Island. In Berlengas, Shags have been monitored regularly over the last 30 years, having been counted 90 couples in 1995, 79-105 couples in 2002 and 82 couples in 2012. It nests between February and July, alone or in small colonies, on inaccessible cliffs. The nest is built on sheltered platforms, crevices or in caves. In recent decades, the breeding population has remained relatively stable; however, European populations are showing a decreasing trend. One of the goals of LIFE Berlengas is to increase the knowledge about the size and population trend of shags in Berlengas. 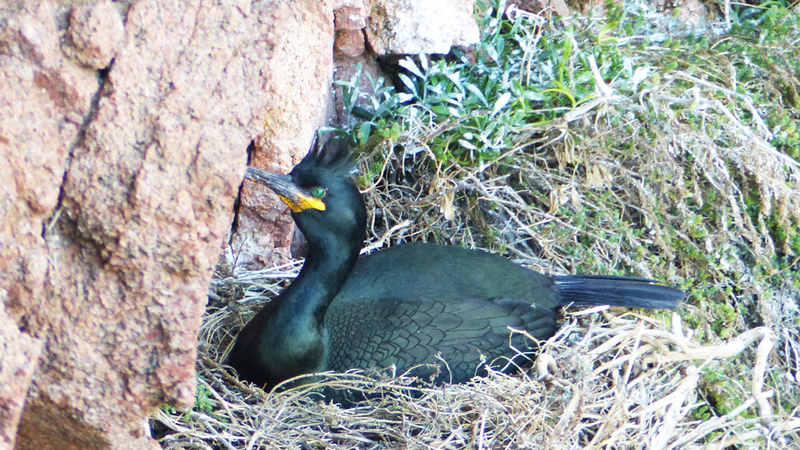 Shags are coastal birds that explore rocky habitats, feeding on fish caught in shallow waters. Because of their foraging behaviour, shags may be vulnerable to some fishing gear such as gill nets. However, their foraging areas within the Berlengas SPA are poorly studied and the real impact of fishing gear on this species remains unknown. Thus, in LIFE Berlengas we will study shags and track 40 individuals with different types of geolocation devices (GLS and GPS-logger), in order to identify their vital areas and interactions with fishing gear.